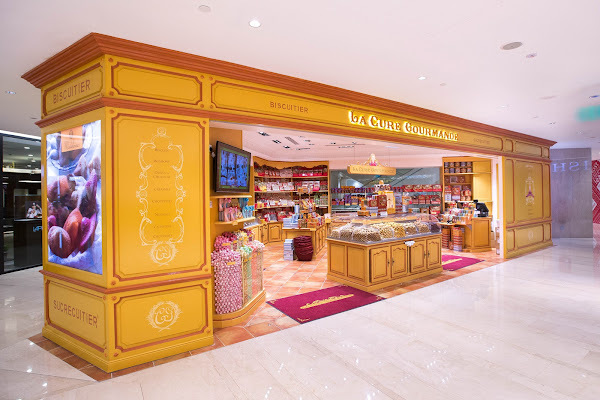 La Cure Gourmande specialises in traditional French confectioneries and opened last month at Takashimaya S.C. at Ngee Ann City in Singapore. This is its flagship store in Asia and customers will be spoiled for choice with 170 handmade confection goods being offered at the shop! Founded by Mr. Christian Berlan and Mr. Edouard Hennebert in Southern France, Balaruc-les-Bains in 1989, La Cure Gourmande is renowned for reviving French confections, and the vivacious expression “l’Art de vivre à la française” (the French art of living). The two founders are involved with every step of the process from start to completion, right from assessing the quality of craftsmanship to the choice of premium ingredients, in order to ensure consistency in the quality of their products and thus all their confectionery is made in France and are flown in regularly to their stores worldwide. One cannot help noticing the picture of a little girl which seems to be the brand’s icon, as she can be seen displayed almost everywhere in the shop and also on the merchandise packaging. She is Margot, the daughter of one of the founders, but has since grown up today. I have to say that the front of the store has an enticing assortment of biscuits, some of which have fillings and some are made without butter (sunflower oil is used instead) to cater to those who are more health-conscious. Filled Biscuits – These are naturally flavoured crisp butter cookies filled with chocolate and fruit jams. Available in Lemon, Apricot, Apple & Cinnamon, Raspberry, Caramel and Chocolate. More flavours such as fig, orange and others, will be added into the selection soon. Mantecao – Made from a traditional Mediterranean recipe, this classically Spanish shortbread cookie is delicate and crumbly. Available in Lemon, Almond and Chocolate. These biscuits have a shelf life of about a week and fresh supplies are re-stocked regularly to ensure freshness. Navettes – A traditional shortbread pastry from Marseille, Navettes were first created in 1781 for the pilgrimage of St Victor. Shaped like the boat which according to legend, carried Lazarus and the Marys’ (Mary Magdalene, Mary Salome, Mary Jacobi) along with St Sarah to Provence more than 2000 years ago. Available in traditional Orange Blossom (natural flavour), Cinnamon (natural flavor), Vanilla (natural flavor), Almond & Dried Fruits and Nuts. Salty Savoury Navettes are available in flavours like Provence Herbs, Cumin, Turmeric, Chili powder, Black Pepper, Black Olives, Sesame, Paprika, Onion, Roquefort (blue cheese) and Curry. I especially liked the Cumin flavoured one as it reminded me of muruku, one of my favourite Indian snacks. 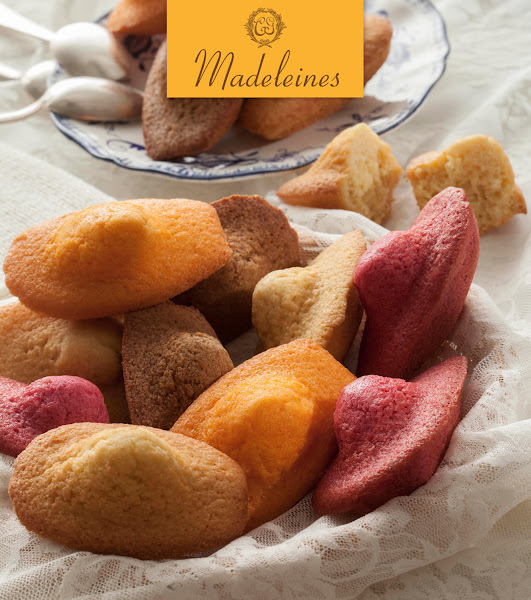 Madeleines – These are made according to the founder’s traditional recipe with fresh butter, eggs, flour and a lot of passion! I have to say that they are perfect for afternoon tea and I couldn’t resist buying them! Available in Filled Madeleine with Chocolate, Orange, Blueberry, Raspberry, Caramel. There is also the Plain Madeleine with a hint of vanilla. Offer 2 pieces with every purchase of 10 pieces. It is recommended to put these in the microwave for 2 minutes to get an enhanced buttery flavour. If you buy 12, they will be packed in a gift box. Olives au Chocolate – I fell in love with these chocolate olives but they aren’t really olives and are actually chocolate coated almonds which are shaped to look like olives!! These are also available in gift tins and glass jars. Pralines – There were too many to choose from and I was tempted to try them all!! Chocolate Bars – For those who prefer their chocolate in a bar form, there are a variety of flavours to choose from. Calissons – I don’t recall eating them before but it’s a traditional French candy made with candied fruit, almond meal and topped with icing. When I put one into my mouth, I immediately thought – hey, this tastes like marzipan! I guess this particular confection could be an acquired taste for our Asian market but marzipan lovers should like it! Nougats – These are the chewy kind and several types are available, with an assortment of nuts and candied fruit. I usually prefer crunchy nougats over the chewy ones, but these are really good and not too sticky! Caramels – Soft and naturally flavoured, you can find an assortment of nuts and candied fruit in them. Unfortunately, I’m not a caramel lover, so although I did buy some to try and thought they were nice, my personal preference would be to buy the other confections available at the store over this anytime. Caramel lovers should like them. Available in Salted Butter, Chocolate Orange, Chocolate, Coffee, Fig, Marzipan Candy, Strawberry, Hazelnut, Nuts, Vanilla, Chocolate Hazelnut, Cinnamon, Sesame and Nougat. If you buy just a few pieces of the caramels or nougats, they will be placed in a bag similar to this. 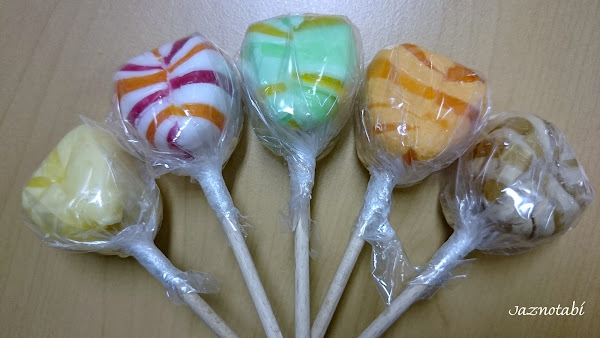 Choupettes – These traditional specialty lollipops from the South of France are naturally coloured and flavoured with fruits or famous candies. The sugar is cooked and hand pulled giving it a delightful swirl of colour. Lemon, Raspberry, Coconut, Cola, Chocolate, Milk Raspberry, Vanilla, Orange, Strawberry, Green Apple, Cherry, Bubble Gum, Cotton Candy and Caramel. These were some of the flavours that I had bought to satisfy my sweet tooth and I have to say that the lollies are much bigger than the usual commercially available ones and I found it a bit of a challenge to put one into my mouth! The flavours were yummy though! If you can’t decide on which confections to buy due to the wide variety available, there are various assortment boxes that you can choose from – the picture below is an example of one of them. According to Mr. Edouard Hennebert, one of the co-founders, their products are not distributed in supermarkets and are sold exclusively at their brand’s shops worldwide, as they want to emphasize on service to their customers, so as to promote a real shopping experience which results in happy customers! The staff on the shop floor are called “Sunshines” (there are 6 of them in this boutique) and they are a friendly bunch who make you feel very welcomed at the store and will only be too glad to assist you with any questions about the confections, plus offer product samples (if available) for you to try. La Cure Gourmande takes great pride in offering handmade vintage confectionary goods that are sold in shops decorated in unique French style. If you examine the shop in Singapore carefully, you will see cornices lining the ceiling and these had been brought in from France too! Well, everyone has their personal preferences and favourites, plus there are just too many choices in this shop that I was really overwhelmed when I stepped in! He also recommends the lollies for younger people. I love their specially decorated gift boxes and vintage designed tins – fill these up with the yummy confections and I think they will make good presents! To-date, La Cure Gourmande has more than 70 stores located in France and 20 other countries. 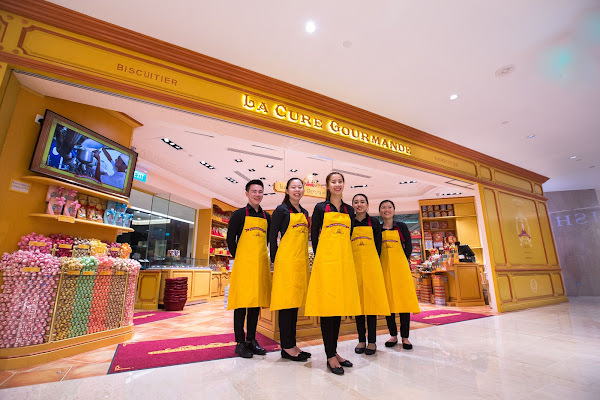 Singapore is the second Asian country (the first was South Korea) to welcome La Cure Gourmande and is home to the brand’s Asian flagship store. An interesting version of pineapple tarts which I stumbled upon this year were these colourful ones which have different flavours for their pastry base and are made using brown sugar. A bottle of these goodies costs $16.80. 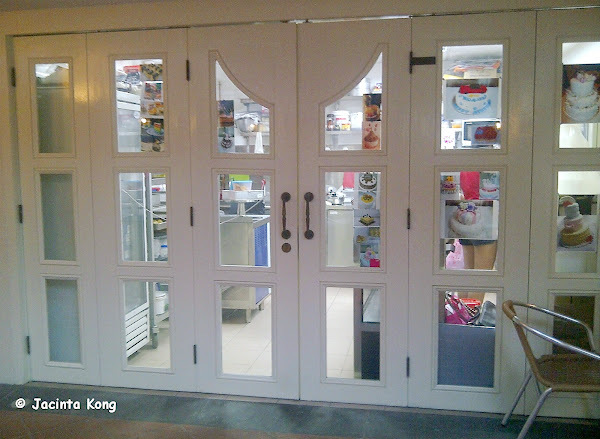 They also have several other branches which are located in various parts of Singapore. I was delighted to find this bakery in the HDB heartlands which sells traditional style cakes that were popular during my parents’/grandparents’ younger days, as well as modern cakes with variety of interesting flavours! All the above sponge cakes were very soft and fluffy and the various flavours were just the way I remembered them to be. I believe they may have tweaked the recipe for the cream as I remembered I didn’t like the cream when I was little because it had an oily aftertaste, but the cream which they use here is lighter and the jam isn’t too sweet. You won’t feel like you’ve had too much cake after you’ve eaten these. I tried some of their other interesting cakes on subsequent visits and some of the flavours shown below can be bought either as individual slices or as a complete cake. Orange Zest Chocolate – I love chocolate and orange so this was a perfect combination for me. The chocolate cake was rich enough and combined with the citrusy fragrance, it was a delight to the tastebuds! Nuttymisu – It’s like eating tiramisu with lots of nuts in it. An interesting combination and quite nice. Cat Mountain King Durian – Ohh…durian lovers may like this. There are obvious bits of durian flesh sandwiched between the sponge layers. Can you see the fibres? Pulut Hitam Cake – A yummy creation which tastes really like the dessert and is just as fragrant, except for the fact that it is in cake form. Mango Passionfruit – The taste of mango with passionfruit was very refreshing and I really enjoyed this cake! Butter Cupcake – This comes topped with various popular character figurines. There were too many to choose from so I picked Elmo. Peach Cake – This looks and tastes like something I may have eaten during my childhood but I can’t put my finger on when it was. If you like peaches, you’ll definitely like this but I’ve only seen this once or twice at the bakery, so either they don’t make it very often or it’s sold out pretty quickly. 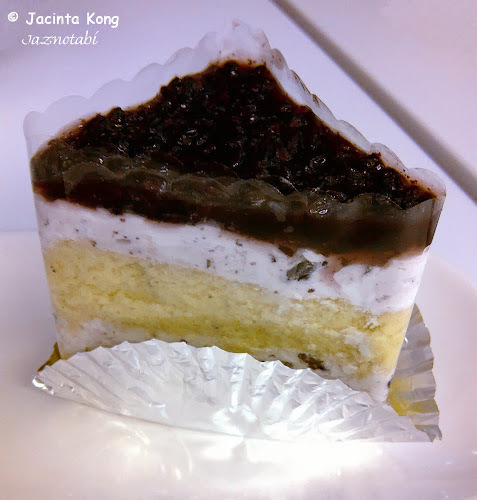 Overall, the cakes here are really good and it’s hard to choose the best one as all are tasty and have the same soft, fluffy texture, with cream that is fragrant and light on the tastebuds, plus the jam (if any is used) isn’t too sweet. However, out of everything that I have tried to-date, I didn’t like the cupcake (i.e. the one with the figurine) as it was more like a muffin and the texture of the cake was a bit harder. Lucky Bundle (吉祥福) – For Chinese New Year (CNY) 2014, this is is being sold at $38.80 and reminds me of fukubukuro (福袋), which is popular with the Japanese. It contains mystery CNY goodies worth $68.80. Well, I was undecided on which new year goodies to buy, so I left it to fate as I believed whatever I’ll get should taste good. Red Tea Roselle Cookies – These are red tea infused cookies with bits of roselle flowers for a tangy taste. Red Velvet Cookies – This crispy cookie is studded with white chocolate bits. Opening Hours: Daily 08:30 – 21:30, but they may close for several days during the Chinese New Year (check their website or Facebook page for more details). 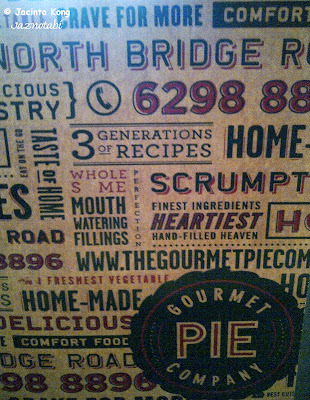 This place sells handmade pies incorporating flavours from Asia, Australia and England, and has a mainly Caucasian clientele. 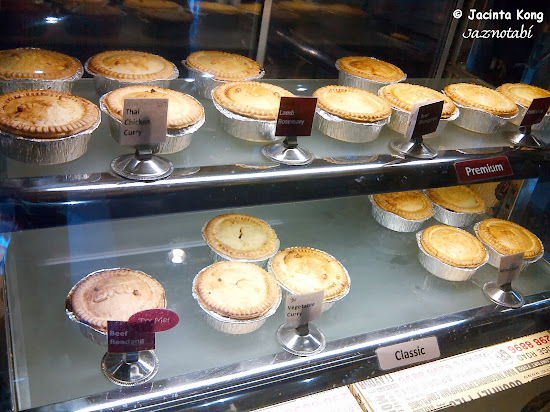 A variety of pies are available and you can even find flavours like Beef Rendang and Thai Chicken Curry. The pies are divided into Classic and Premium ranges and the latter costs more than the former. Each pie has alphabets on its pastry cover which identify which flavours they are. I decided on the Beef Bourguignon pie and opted to top up a couple more dollars to have a set which includes 2 side dishes and a drink. 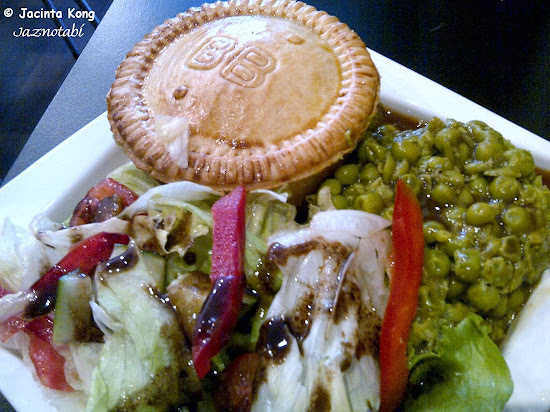 Choices of sides are garden salad, coleslaw, potato salad, mushy peas and mash potato but subject to availability. As mash potato wasn’t available that day, I decided on garden salad with a vinegrette dressing and mushy peas with gravy. 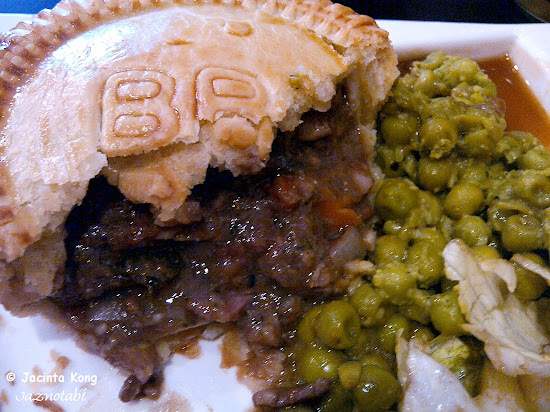 I was satisfied with my choice of pie and found the filling to contain minced beef in a rich, flavourful beef gravy, which had a hint of red wine in it. My friend had the Minced Beef pie which seemed to have a drier filling as compared to my Beef Bourguignon pie but she was happily enjoying her meal so I didn’t take any pictures. Although the pies are not bad, I guess most of the locals think it’s a little pricey and may prefer to spend their money for lunch/dinner at other eateries. 2 Circular Road, Singapore 049426. These durian cream puffs are of a decent size. I bit halfway into the first one and it was so full of cream that half of it oozed out onto the palm of my hand! The puffs were generously filled with delicious durian puree and the pastry was light and fragrant – a perfect combination! 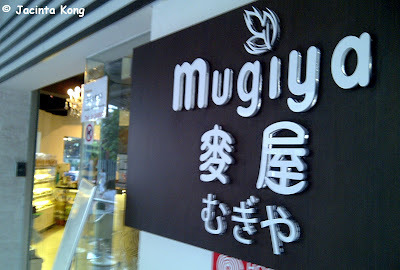 Verdict: I was thrilled to have found this bakery and I’ll definitely buy the durian puffs again! I started patronizing this shop more than 10 years ago and I still think their soon kueh is the best in Singapore! One box of 5 soon kueh costs $6.50. Their soon kueh is traditionally made and contains a bamboo shoot filling instead of the turnip version which is commonly sold these days. The skin is soft, thin and slightly chewy and the bamboo shoot filling is tasty. The shop does sell other types of kueh like ang ku kueh, koo chye kueh, rice kueh, etc.. but my personal favourite is still their soon kueh. Couldn’t resist trying the colourful macarons which were displayed at the counter! The flavour of the earl grey ice cream was too strong for my liking but the chocolate was nice. I found the desserts too sweet but if you are game for a sugar rush, you might enjoy them! Found this bakery at the junction of Kensington Park Road and Farleigh Avenue. This particular bread caught our eye as we walked past the bakery, hence we decided to enter to check it out. It was unlabelled so I’ll just call this Sushi Floss Bread since it looks like sushi. Verdict: It tasted like ordinary floss bread which was wrapped with a layer of seaweed. Nothing special apart from its appearance. Verdict: It tasted quite plain actually…was rather disappointed as I had expected it to be more fragrant. Both bread and cake didn’t have much taste and only the top crust with the toasted almonds was nice. Verdict: Will definitely buy this again! Hokkaido Sweet Potato – This was surprisingly quite nice. The bread was fragrant and the black sesame seeds gave it an extra crunch. The sweet potato filling also complemented the bread well. Verdict: Will most likely buy this again. Oreo Donut – I wasn’t blown away by this and thought it was just okay. Verdict: Think I’d prefer to patronise the shops specialising in donuts if I want my donut fix. 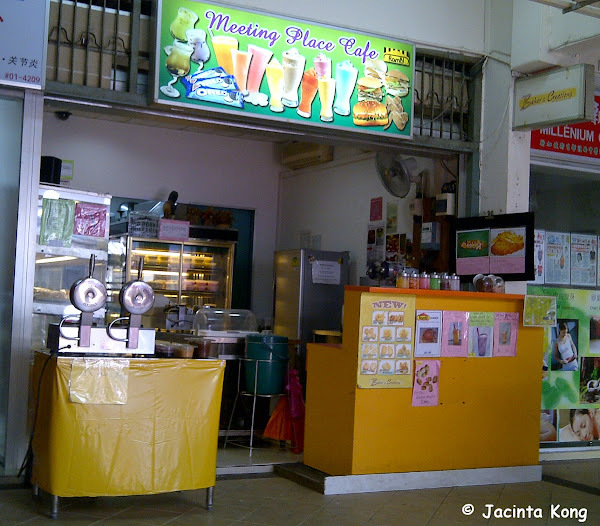 Tried the apple pie at this bakery which is located in the housing estate in Yishun and found it was quite alright. One of my friends likes it as it’s not too sweet like most apple pies are. The chunks of apple in the pie were baked just right – not too soft and not too crunchy. Also bought some mini blueberry and strawberry pies to try. I think the strawberry pie tastes better than the blueberry. Both were actually jam-filled and I think the apple pie was still the best of the lot. The bakery is know as Baker’s Creations which is kinda misleading cos the big signboard at the bakery states “Meeting Place Cafe” and initially I had problems locating this place, then noticed the address was identical. Upon closer inspection, there was a small sign at the corner of the shop which says “Baker’s Creations”. This is my favourite place for bread and I prefer it over BreadTalk. Green Pumpkin Bun – This has been the #1 bestseller at the bakery for a long time and is the bakery’s signature bun. Its appearance resembles a pumpkin with “green skin” and it’s filled with pureed pumpkin. Pumpkin lovers should try this!! Green Tea Bun with Matcha Mochi – this sounded like an interesting combination so I bought it to try. The green part at the top of the bun had a fragrant taste of green tea and when you get to the middle, you will encounter a chewy texture which is the matcha-flavoured mochi. Overall, quite a tasty bun which is rather interesting due to the different textures contained within. Takoyaki – At first I thought this was really takoyaki (and a giant one!) as it really looks like it! Actually, it was a bun, made to look like takoyaki (What was I thinking? This is a bakery so obviously they sell bread and not takoyaki!! Oops…my bad…heh heh). The first bite was a bit salty as the piece I bit off had a bit too much of the sauce but as I continued eating, the flavours came together and I began to appreciate what the baker was trying to create in this bun. It really does taste like takoyaki and complete with a piece of octopus in it too! Sounds ordinary, looked ordinary but I must say it’s quite a huge serving! The ham was good and the cream cheese complemented it perfectly. In addition, the specks of black pepper sprinkled all over the bread gave it that extra kick. Cheese Curry Doughnut – This was the non-fried version. The taste of curry and cheese together was rather unusual but it actually was quite nice. Cream Doughnut – This is really good after you put it in the fridge as the cream in the centre will be cold and it’s like you’re eating custard or ice-cream.